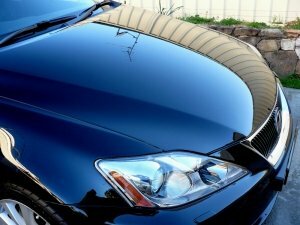 Quartz and ceramic car paint protection coatings are so far, the most durable and efficient products available on the market for automotive body paintwork protection. It is highly advisable to protect the body paint in brand new cars and also in all cars where the paintwork is in a very good condition, for example right after an auto detailing session. In case of damage, the lacquer coating should be corrected appropriately prior to applying protection coating. This way you ensure a shiny and long-lasting result. Not only quartz and ceramic coatings provide a shield against any harmful environmental factors such as UV radiation, acid rains, bird droppings, insect residues, road salt and tar, or keep your car clean for longer and make it easy to wash, but also, they significantly reduce the formation of micro scratches on the body paint. Those are usually a result of improper body paint maintenance. There is a very good reason why we call a ceramic paint protection a sealant – it simply sums up what is does – it seals car’s body paint and makes it less prone to scratches and blemishes. 1. Primary hand free wash using high quality body-paint-friendly active foam with a neutral PH to remove the very top layer of dirt. It’s also safe to use on all rubber or plastic elements. We simply wash it off after a couple of minutes. 2. Main, thorough hand wash using top grade PH neutral shampoo and plain natural wash mitt made of sheep wool or a sea sponge. Washing technique used here matters too. It is important to cleanse mitts and sponges properly after each use. We even have specialists water buckets designed to keep all washed off dirt at the very bottom of the container. 3. Cleaning the wheels – you can choose to have them removed for an ultra-clean inside-out result. We only use top quality products. Our choice of lacquers, polishes and chromes will exactly match the type of your wheels and are safe and effective to use. 5. Complete Decontamination - this is an extremely important part of the overall auto detailing process. We need to examine car’s body paint thoroughly and find any blemishes or contaminated areas caused by road tar, bird droppings, tree sap or iron filings from railway lines. We use specialist products and use subtle techniques to remove all impurities and prepare your car for further treatments specified within the chosen service. 6. Lacquer preparation and protection – we make sure the body paint is properly degreased, smooth and ready for application of the protective ceramic or quartz coating as per your choice. The better attention to detail, the better bonding of the final coating. 7. Wheel rims protection applied by hand – ceramic or quartz as per your choice – we guarantee perfect, long-lasting finish. 8. Final dressing application for remaining elements and tyres – the devil’s in the detail as they say and rightly so, because the final look and feel is determined by the finish of the elements that give your car its unique appearance. Once we have finished auto detailing your car, it needs to rest for about 24 hours so the products and coatings bond and settle properly without being exposed to UV radiation or any other atmospheric or environmental factors that would undermine the integrity of the overall process. If you wish to discuss any of the above treatments in detail, don’t hesitate to contact our friendly team.